The early universe went through itsown dark ages before thefirst stars formed and emitted the first light. Now astronomers aretargetingthis early epoch to try to learn precisely when that happened, and how. So far, it has been difficult tolearn much about theuniverse when it was so young, because any evidence is extremelydistant and faint. But a new study of ancient radiowaves offers some hope thatmore answers could be around the corner. The period when the universe's firststars formed and beganshining their light is called the reionizationepoch. 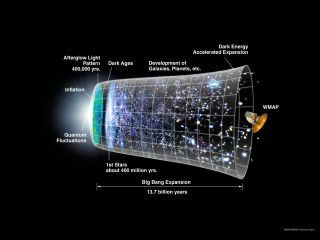 Astronomers' current best guess isthat it was somewherearound a couple hundred million years after the BigBang thought to have set the universe in motion 13.7 billionyears ago. Butresearchers would like to refine that estimate considerably. Before this epoch, the universe wasmade mostly of roughlyuniform hydrogen gas. "We call that the dark ages becausethere wasn't reallyany light being generated," said astronomer Judd Bowman of ArizonaStateUniversity, leader of the new study. Then slight ripples in this gascaused denser areas to clumptogether under gravity, eventually accumulating enough mass to collapseintostars and begin nuclear fusion. The radiation emitted by these firststars interacted withthe leftover hydrogen gas around them, exciting the hydrogen atoms andknockingoff their electrons, creating positively charged hydrogen ions. Hencethe namereionization epoch. Still, the details of how and whenthis happened areunknown. To probe the universe's history,Bowman and his colleague AlanRogers of the Massachusetts Institute of Technology custom-built aradioantenna called EDGES and deployed it at the Murchison Radio-astronomyObservatory in Western Australia. Since identifying light from theearliest stars and galaxiesis so difficult, the astronomers tried a different tack. They aimedtheirdevice to look instead for the hydrogen gas between the galaxies, whichwouldhave emitted a characteristic radio signal. Then, they looked for signs of howthis signal may havechanged over time, due to the emergence of galaxies and stars thatwould haveionized the gas. Eventually, when all of the gas was ionized, theneutralhydrogen signal would be erased. "Our experiment was designed toconstrain whether ornot that step was very fast," Bowman said. "We didn?t detect anychange, which means it took longer than about 3 to 12 million years"forgalaxies and stars to form and reionization to occur. That measurement is in keeping withmost models of the earlyuniverse, though it does help to rule out a few fringetheories. The realbreakthroughs should come soon, when the scientists are able to refinetheirinstrument design and look at a wider range of radio frequencies. "Our result has not tested themainstream theoriesyet," Bowman said. "We're getting our toe in the door." The most important advance of thisstudy, Bowman said, wasto demonstrate that their method works. The results are detailed in the Dec.9 issue of the journalNature.